"There is no fighting in the war room!!!" If Bob Woodward were a superhero, his special power would be invisibility. No modern writer better understands how to get out of the way of a good story and let the events unfold like Woodward. His new book, Obama’s Wars, is an attempt to inform the reader about what it was like to be part of the decision making process for a President during wartime. He has a genuine love for detailing the way that decisions get made and it shines through in all of his work. Woodward disappears into the fabric of the story leaving us in the fascinating position seeing the story unfold before our eyes. Obama’s Wars is a story about process. 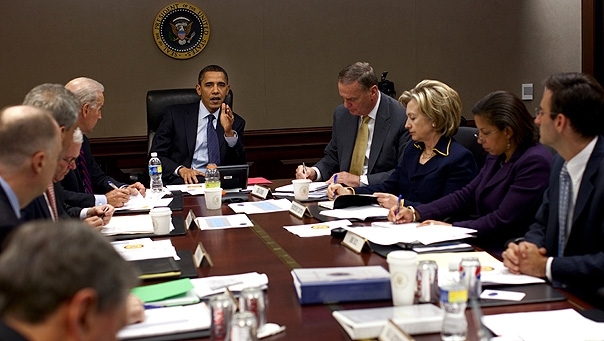 The book details Barack Obama’s system of decision making during the ongoing Afghan War. Obama is surrounded by human beings with differing agendas, egos and belief systems, all of which have an impact on the course of the war. Obama himself is presented in a very human way. The reader is given a first hand account of a person making critical decisions that may well affect the fate of the nation. If you didn’t like him before you read the book you don’t like him after, if you liked him before you read it you probably still do. It’s not a book about judgment; it is a book about explanation. You get to be a fly on the wall for a major event in history. Obama’s Wars is not a political book in the modern sense. The writing is devoid of any clear political, social or economic agenda. The audience is never clear on how Woodward feels about the war. Woodward’s commitment seems to be only to the art of journalism. He wants to get the story as correct as possible based on the insights and beliefs of the people who were there. Woodward has access to all the major players and gives them room to tell their story. They confess their mistakes, laud their own triumphs, admit their petty dislikes and acknowledge their most base desires in a shockingly candid way. At the end of the book, the reader is left with the distinct impression that they are being governed by real, imperfect people who struggle to make planet altering decisions in a way that best serves their picture of reality. This entry was posted on November 26, 2010, 11:41 AM and is filed under The Politics Of Catastrophe. You can follow any responses to this entry through RSS 2.0. You can leave a response, or trackback from your own site. I didn’t think Presidents had the power to make ‘actual’ decision but merely were there to be assigned to a decision. I believe decisions are made by stakeholders and large corporations who profit from these decisions. To be honest – I didn’t think much of Obama and I had/have my doubts and I still do. The ‘Change’ he promised was riding on the back of historic black leaders who actually made the change but where we already have civility its difficult to improve situations. Actually, I have a concern that runs in a slightly different direction. I am worried about the President having too much power to make decisions. The thing that made me uncomfortable about the book was the fact that the Pentagon, the Cabinet, the President and the Vice President were engaged in the process, but Congress, the branch of government given the express power to declare war was almost completely absent. The Executive Branch has grown significantly in power since World War II. It’s gotten to the point where you hear comments like “Obama passed the health care bill” or “Obama might declare war” and they seem normal. This is a drastic misreading of how the system is supposed to work. In terms of my views on Obama, I’m not ready to make a judgement. It’s just too early. I gave Bush Jr. and Clinton the same latitude. It’s hard to be able to assess the impact of a President in two years. Everyone from Presidential candidates to candidates for dogcatcher promise change. Little has changed. I think people are angry with Obama because a lot of people really believed he’d change things quickly. I’d probably feel a bit more confident if he didn’t have so many Goldman-Sachs cast-offs around him. I don’t know if he’s got it in him to make the type of unpopular decisions that are needed to repair things, but I’d be overjoyed if he did. I have similar concerns about the role of corporate money in the political process, particularly since the Judicial gutting of the McCain-Feingold bill. That one keeps me awake at night. Adding to books-to-read list, sounds really interesting! This one is great. The best Woodward book to check out is”The Brethren” a book he wrote about the US Supreme Court in the 1970s. Let me know what you think of this one when you get to it. I’ve long admired Bob Woodward and I’m so happy to see your review here. I haven’t read this one yet but I will be…. Why can’t we see more journalists like him on the air instead of some of the crazy pundits we see? Just think – we all be better educated and our blood pressure would stay in the normal range. Hmmm…I think I just answered my own question. There really is something to be said for the craft of reporting. Seeing a talented writer paint a picture that isn’t a self-portrait is a truly excellent thing.